John Thomas, Pencerdd Gwalia (lit. Chief Musician of Wales) was born in Bridgend on St David’s Day, March 1st 1826, to John and Catherine Thomas. His father was a tailor by trade, and a talented amateur musician. 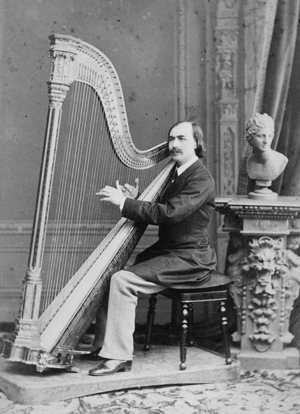 John, their eldest son became a professional harpist, was given the title of Chief Musician of Wales and became Harpist to Queen Victoria, and to her son Edward V1. John Thomas died in London on March 19th 1913. One hundred years later, the “Pencerdd Gwalia Festival” will be organised by Coleg Telyn Cymru (The Harp College of Wales). Two competitions and a concert will be held to celebrate and appreciate his enormous contribution to the repertoire of the harp and share his inheritance. Coleg Telyn Cymru is grateful for the support given by the Arts Council of Wales towards the John Thomas Festival Concert. This web site is designed and maintained for the festival by Creighton's Collection, specialist publishers, printers, distributors & retailers of harp music. If you have a problem with this site please contact Creighton's Collection using the "Report a problem" link to the right.